Defenders from Newcastle United and Arsenal were the unlikely Dream Team heroes in Gameweek 23 of Fantasy Premier League. 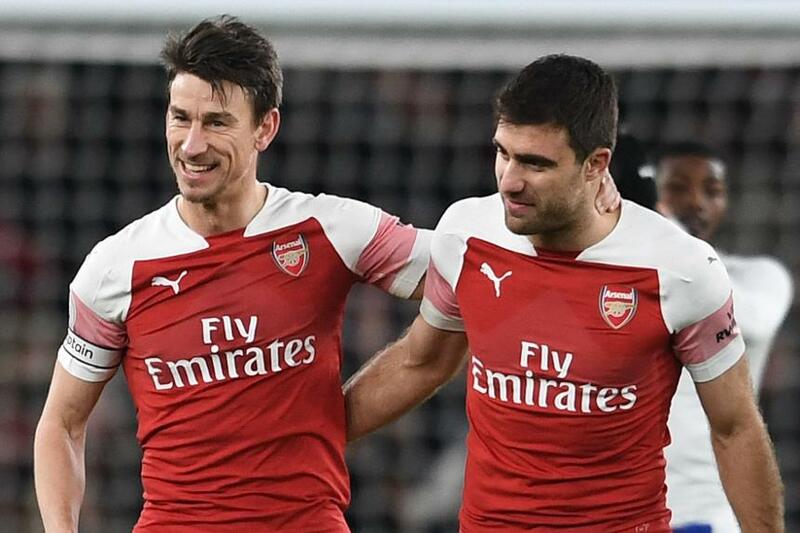 Newcastle centre-back Fabian Schar (£4.6m) led the way with a 21-point haul – the joint-highest individual score of the season – as Newcastle beat Cardiff City 3-0, while Gunners duo Laurent Koscielny (£5.4m) and Sokratis (£5.1m) both recorded double-figure hauls against Chelsea. 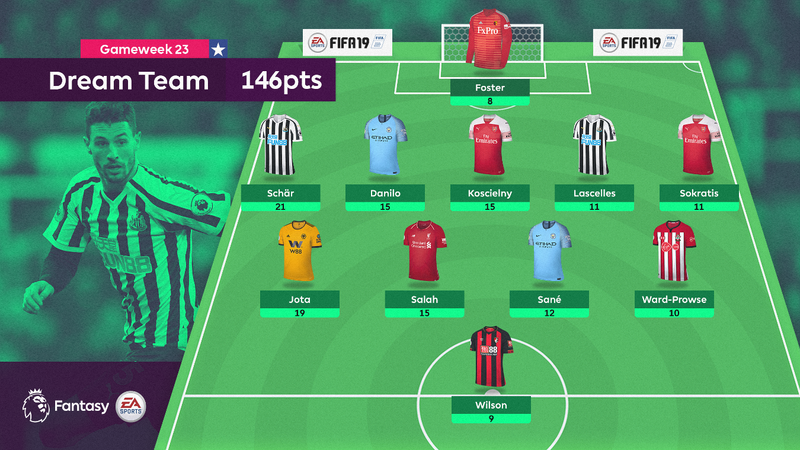 Indeed, all five defenders in the Dream Team returned at least 11 points as a 5-4-1 formation produced 146 points overall – just five shy of the season's highest tally. The Watford goalkeeper earned a clean sheet plus save and bonus points as the Hornets drew 0-0 with Burnley. The Switzerland international scored a superb individual goal, added another and brought in clean-sheet points to complete one of the finest all-round performances of the season. His ownership has doubled to 0.3 per cent as a result. The full-back's first league goal of the season set Manchester City on their way to a 3-0 win at Huddersfield Town. He has now scored 21 points over the last two Gameweeks. Arsenal kept only their fourth clean sheet of the campaign in a 2-0 win over Chelsea, thanks in part to their captain. Koscielny sealed the win with the Gunners' second goal and was awarded maximum bonus points. An assist and two bonus points helped the Newcastle captain to his first double-figure score of the season. The centre-back set up Koscielny's goal to record a second assist in three Gameweeks. He has now started nine of the last 10 Gameweeks and is forming a useful partnership with his French team-mate. The star of Wolverhampton Wanderers' 4-3 win over Leicester City, Jota is finally finding his feet in the Premier League. A hat-trick against the Foxes means he has scored all five of his goals for the season over his last five Gameweek appearances. FPL's most popular player, with 49.8 per cent ownership, Salah is a points magnet at present. The Egyptian's two goals in Liverpool's 4-3 victory over Crystal Palace produced a sixth double-digit return in eight Gameweeks. The Man City winger made it three straight Gameweeks of returns with a goal, assist and a bonus point against Huddersfield. Sane has scored 30 points in that time and is in the top four for Gameweek 24 transfers in. New Southampton manager Ralph Hasenhuttl has started the midfielder for four straight Gameweeks and Ward-Prowse has responded with back-to-back goals. He scored for the second week running as Saints beat Everton 2-1. The Dream Team's sole striker scored his 10th goal of the campaign as AFC Bournemouth defeated West Ham United 2-0.